Photo’s – Carl Barker and Charlotte Bull Photography. The Mountain Mania Cycles – Ricochet Downhill Race was originally planned for the 18th March but when the weather intervened and the ‘Beast from the East’ brought snow to the UK it meant that the race had to be cancelled. So all eyes were on the weather into the weekend of the 9th and 10th June. With the forecasters unsure of which way the weather was going to go everyone waited with baited breath and fingers crossed that it was going to be a good one for racing. With Ricochet prepped to an inch of it’s life in the run up to the Race the track was running fast as the racers smiles were wide. 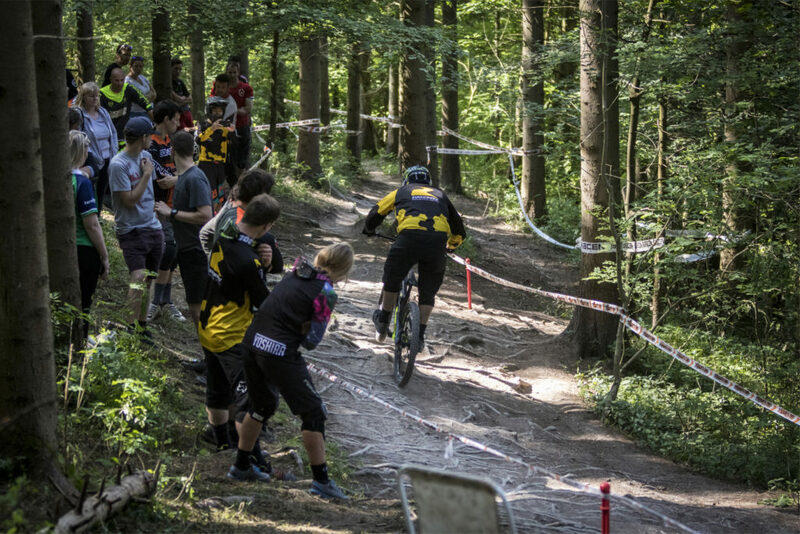 Ricochet is one of the fastest tracks in Aston Hill Bike Park. It starts with a pedal fest over some big tables with laying down the power a key to a good start as is keeping it low over the jumps! The track then dives into the first of the gravity fed sections a big bombshole which fires riders into a fast straight. The the speed goes up again as riders dive down across the first forest road and then it’s on the brakes as a fast left hander approaches. Holding your nerve and carrying your speed here is key. Then the track opens up with a range of line options as it swings right and into the fast shoot before another fast left hander. The track then traces the contour of the Hill as the speed picks up and riders are fired through the trees into yet another fast left hander. Here the track opens up yet again though a section known as ‘Roof Roots’ as the camber resembles a pitched roof. High, middle and low lines shoot riders down into a big compression (clocking 3.9G on the Shredmate) then it’s back on the pedals before hitting the roots. Carrying your speed through the root garden and through the trees at the end of it is the key to a good run. Staying off the brakes here takes confidence and focus. The riders then fly into a new berm section before being fired out of the final corner with a drop to the left and the inside line to the right. Another fast left hander, off a drop and then Ricochet lives up to it’s name as the riders carry their speed through the trees and are fired out into the finish, breathless but buzzing with adrenaline. Finn Chapman put together a stunning second run to stop the clock on 1:22:22 and take home the DMR Trailstar Frame. 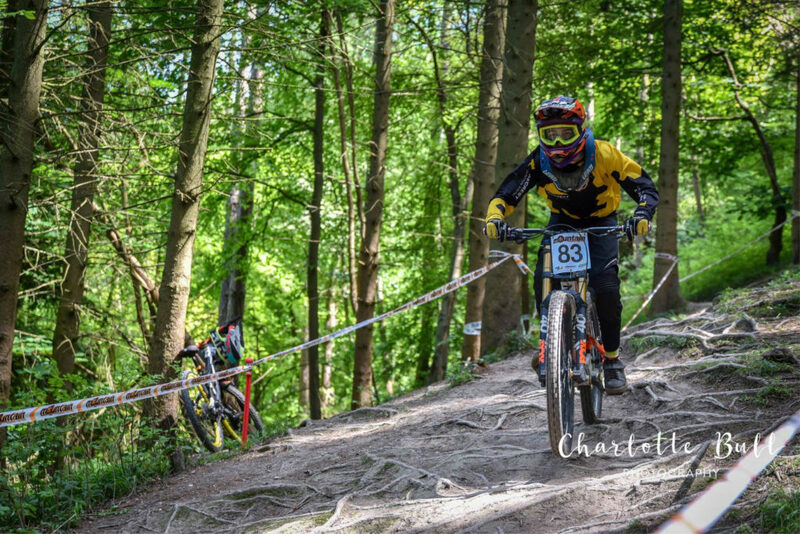 James Eldridge entered his first Downhill Race with no idea how it would go. Showing his hand the week before on the Adult DeVo Ricochet Race MTB Skills Course it came as now surprise to see him on the box, with an arm full of DMR and Mudhugger prizes clocking a time of 1:25:65. Jake Scott (Firecrest MTB) rounded out the top three stopping the clock on 1:30:30. George Madley (Regent Projects) put in a great second run to clock a time of 1.27.60 to take the win. Nathan Dwell-Wilson (DC Cycles) also went fast on his second run stopping the clock on 1:33:75 with Aiden Swaby taking third place with a time of 1:43:13. 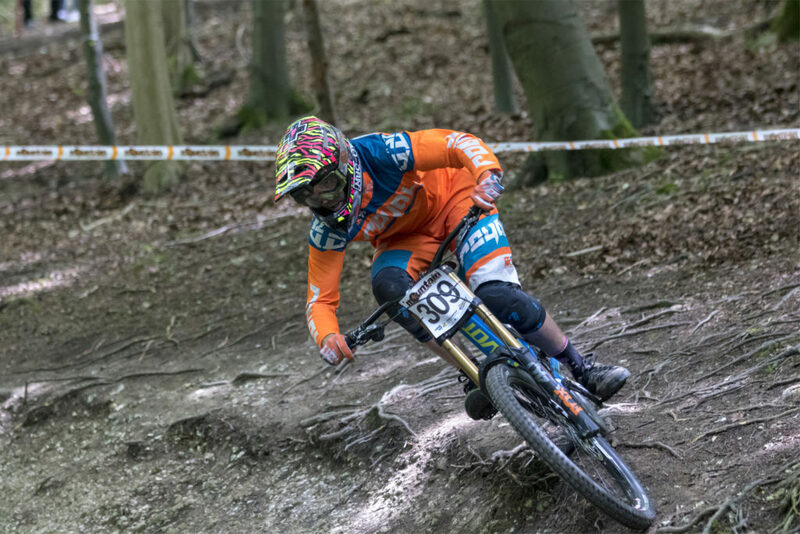 Oliver Sinden (Firecrest MTB) came home in 4th place despite a spill on second run that will see him sidelined for a few weeks with a fractured wrist. Oliver Laurie (Firecrest MTB/Summit) made his racing debut coming down in a time of 1:57:82 as the youngest competitor on the day showing that he’s a rider to watch for the future! Kenzie Nevard (Calibre Bikes/Kore/Fasthouse/Firecrest MTB) has his work cut out on his second run after catching two riders on his first. He didn’t waste any time in getting to the bottom of the hill the second time though. Clocking a time of 1:25:94 to take to the top step. Chill Sweeney had been looking quick throughout practice and he came home in second with a time of 1:26:67. Alonso Barbour (Firecrest MTB/Wheelie Bike Shop) rounded out the top three with a time of 1:27:31. The Youth category is brimming with talent right now and it was a three way battle for the top of the podium. 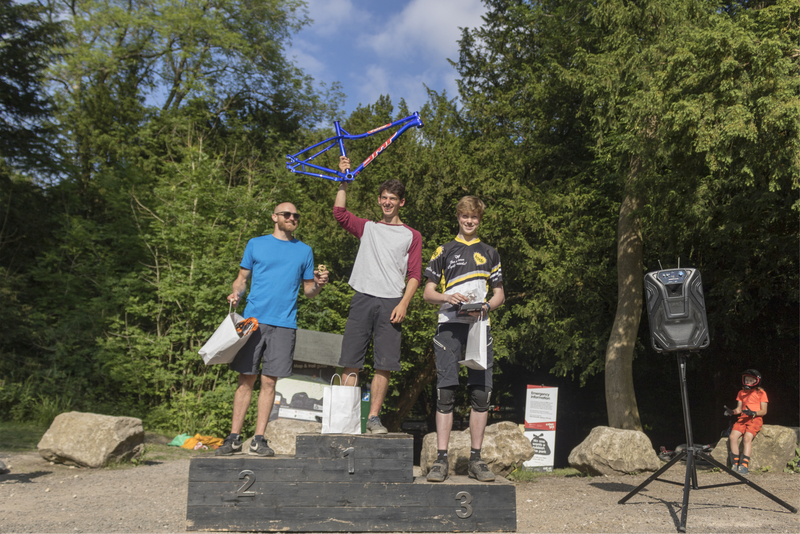 Jeremy Coe (Team Aston Hill/Lovelo MTB Team) just came out on top clocking a time of 1:20:81 on his first run and edging Tom Shakespear (Firecrest MTB) into second place by just 0.18 or a second! Luke Ward (Firecrest MTB) clocked a time of 1:22:13 to take 3rd and underline his status as a rider to watch having been racing for just 18 months! With Aston Hill – Lovelo Race Team rider Josh Mead away in Leogang on World Cup duty the result was wide open. 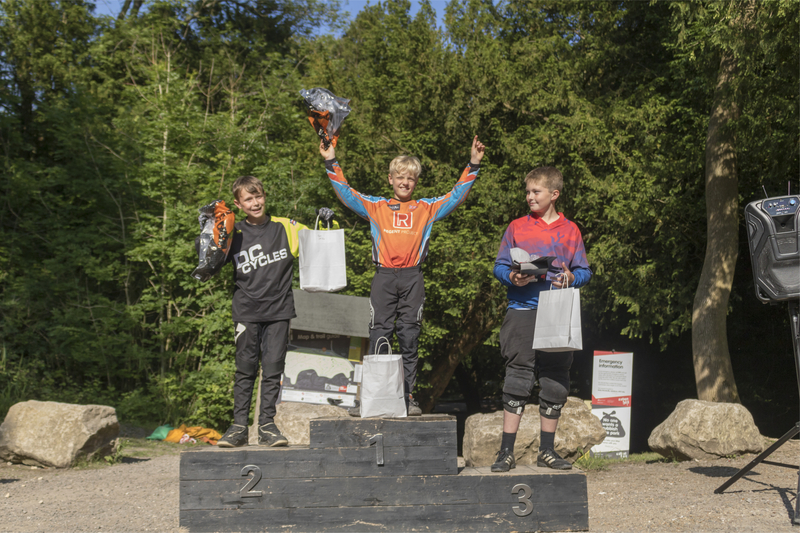 Dec Willicombe (Kustom Bikes) set the pace on his first run clocking a time of 1:19:51 going on to better that with a time of 1:17:76 on his second to take the win from James Perry (Firecrest MTB) with a time of 1:22:25 and Edward Cook (Giant Newport Pagnell) Rounded out the top three with a time of 1:22:28 just 0.03s behind James. The Senior Men’s category is always hotly contested and with the top 5 separated by less than 3 seconds it was the smallest of mistakes that were going to cost riders dearly. Chris Cockrill (Firecrest MTB) set the pace on the first run clocking a time of 1:17.71 to underline how fast the track was running. Conor Buxton found the all important 0.57s of a second on his second run to steel the win from Chris. Tom Seabrook also went faster on his second run to secure 3rd place with a time of 1:18:46 just a 1.32s of the win. The Masters Category was one of the biggest on the day with 57 riders lining up. Stacked with talent Paul Hank’s time of 1:16:74 was enough to just edge Ben Deakin (DMR Mucoff) by 0.35s with Ben clocking a time of 1:17:09 with Danny Harper (Giant Leamington Spa) clocking a time of 1:18:28 to just edge Andy Weames (Mountain Mania) off the podium by 0.01s with the top 10 riders all within 5 seconds of the winner. It was Lee vs Lee for the top step of the podium with Handley (Moir Racing) just edging out Nevard (Calibre Bikes Fasthouse Firecrest MTB) clocking 1:22:56 and 1:23:56 respectively and just 0.67s between them. Dan Kelly went a fraction faster on his second run to secure 3rd with a time of 1:26:18. Megan Nevard (Calibre Bikes Fasthouse Firecrest MTB) set the time to beat on her second run clocking 1:42:25 and the fastest women’s time of the day. 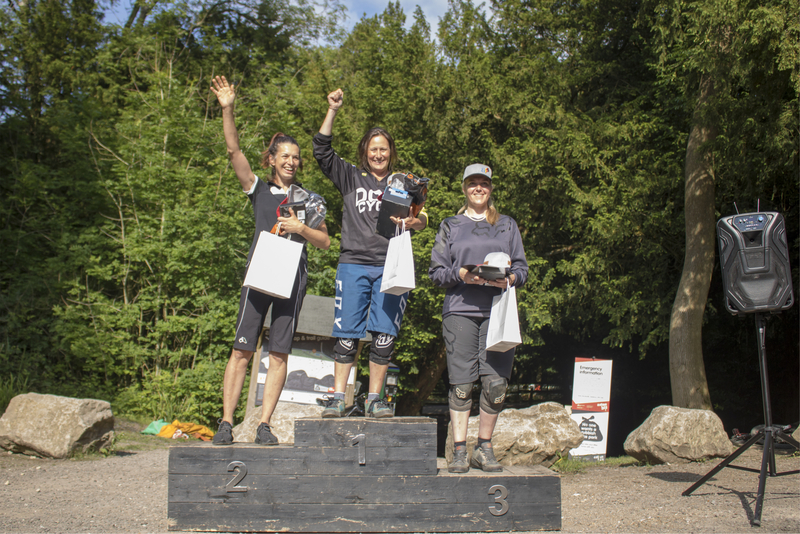 Keeping the sibling rivalry alive for another week it was Meg’s sister Taylor (Calibre Bikes Fasthouse Firecrest MTB) in second place with a time of 1:54:15. Making it four podiums from the four Nevard family members racing which has to be some kind of record? Page Laurie (Firecrest MTB) rounded out the top 3 places with a time of 2:00:53. Renée Diwell (DC Cycles) set the time to beat stopping the clock on 1:44:68 on her first run. As last rider down the win was her’s for the taking and with a time of 1:41:96 she sealed the win. Sue Faraone clocked a time of 1:54:15 for second and Joanna Tucker rounded out the podium just a 10th shy of Sue time with a time of 1:54:25 in third place. The three riders lining up in the Expert/Elite Category knew that every second would count an that the win could be decided by a matter of tenths. In the end Glenroy Martin (Grips Bikes) laid down a time that had riders scratching their head as to how it was possible clocking a 1:16:00 on his first run. There was much between John Holbrook (Firecrest MTB) and Thomas Davies with Thomas just two tenths clear in second place. The big question was could Glenroy go faster? Stopping the clock on 1:15:03 Glenroy nearly knocked a second off his time to secure the win. John and Tom both improved their time but only enough for John to leapfrog Tom into second with a 1:16:54 and Tom to round out the top 3 with a time of 1:17:28. I’d like to thank my Family, friends, Aston Hill Bike Park, Forestry Commission and the Organising Team that work so hard with me make the events on Aston Hill possible- all of our sponsors and partners – Mountain Mania Cycles, DMR Bikes, Mudhugger, Out Skill the Risk, Vee Tire, Visor Leaf, and Saracen Bikes – the Marshal’s, Medics, Dean and the guys that keep the car park running smoothly throughout the day – Action Sports Timing for keeping time and our caterers for keeping everyone fed and fuelled. Thanks as always to a list too long to put here – you know who you are and without your help and support we couldn’t bring these Races to life. Last, but not least, to everyone that supported the Race and understood the challenges we faced due to the weather and back in March and those that entered the June Race. 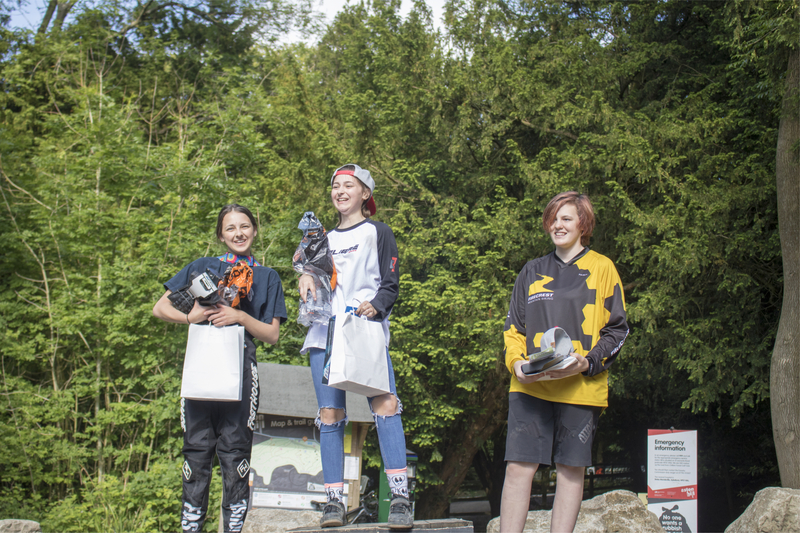 There will be more Downhill Races on Aston Hill in 2019. We’ll be back racing on Aston Hill on Sunday 2nd September with the Pedalhounds Enduro. Keep an eye on the Firecrest MTB Website for dates and details as we get them.